No matter what profession you have, journaling can be a great way to excel not only in work and creativity, but also in your life in general. Many great books were inspired by the personal journals of their authors. While you may not be looking into creating the next New York Times Bestseller, starting a journal will be a sure fire way of airing out your thoughts. Some hold themed journals on just specific topics, others journal about their day – all with a common thread that it is personal. Today, we will take a look at ways you can begin journaling in the digital age. 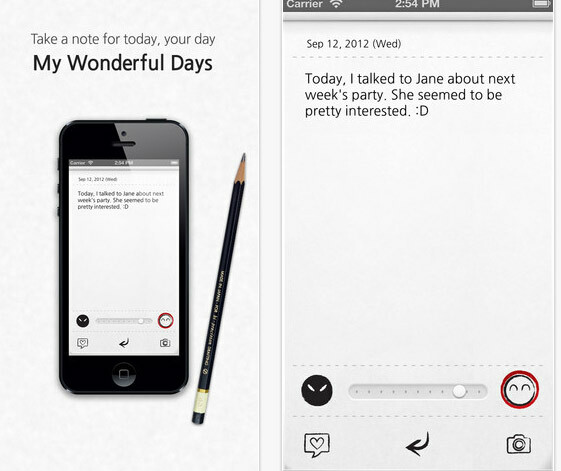 My Wonderful Days is a classic journaling app that is optimized for both iPhone and iPad devices alike. 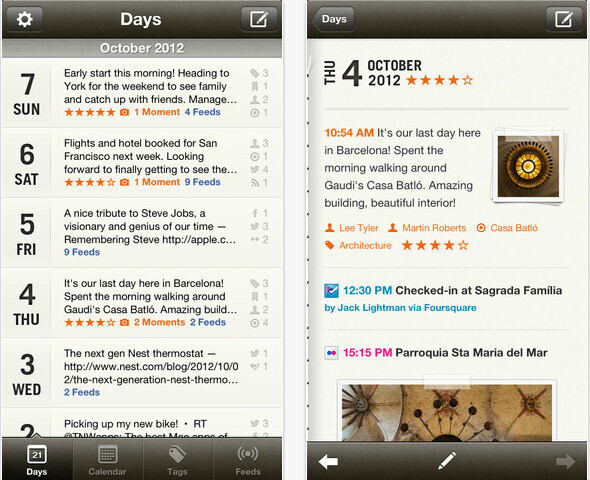 However, there are a couple of features in My Wonderful Days for iOS that sets it apart from the fray. First off, along with having the space to elaborate, My Wonderful Days also allows you to add a sort of emoticon to your day. It isn’t technically an emoticon for just happy, stagnant, or bad – you are able to move a scale allowing you to set the exact happiness (or sadness) the day entailed. 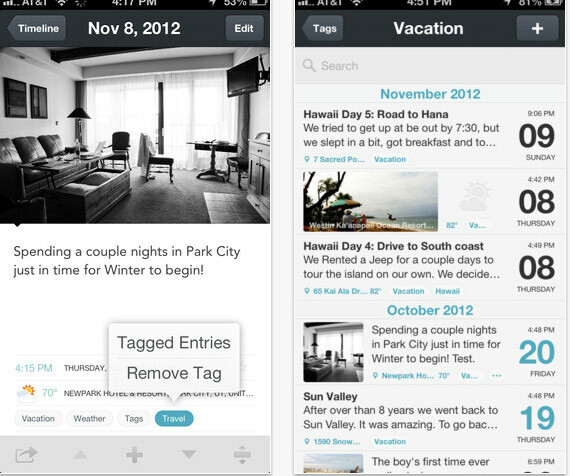 You are also able to add photos and other pieces to add flair to the day on this iCloud enabled app. Days are able to get printed to safe keeping, passcode protected for safer keeping, and starred if they were extra special. My Wonderful Days is available for all iPhone, iPod Touch, and iPad devices for $1.99. Day One is considered a household name of journaling apps for Apple devices, and rightfully so, the application is stunning. Day One, which is compatible for all iOS mobile devices and for Mac, allows you to tack on photos, your location, weather information, as well as tags and of course text to compile a passcode protected entry for the day you just experienced. All shown in a calendar view, you are able to have entries synced through iCloud and even have it ping automatically to our Dropbox or Evernote – all in an attempt to have your Day One entry reach all parts of your digital life. If you are looking for the application that is geared directly for your needs – most likely an iPhone user who has never flirted with keeping a diary ever in your life, Momento is the app for you. Using the information from your linked services and networks, Momento already gets your journal started by adding your social media posts to your day’s entry. From there, throughout the day, you are encouraged to journal in the password protected app, instead of creating a master post each day. This sort of gives it an element of being a social media app – minus the social – because you are posting short blurbs to yourself instead of long posts. Evernote is known more for note taking than journaling. However, despite the lack of features that are exclusive to many journaling apps, like passcode protection, Evernote actually is quite similar (if not better) than many of the big name journaling apps on the market today. First off, Evernote is free. If I haven’t sold you on Evernote yet, then let me share Evernote’s other strengths. The app also is as universally compatible as it can get. 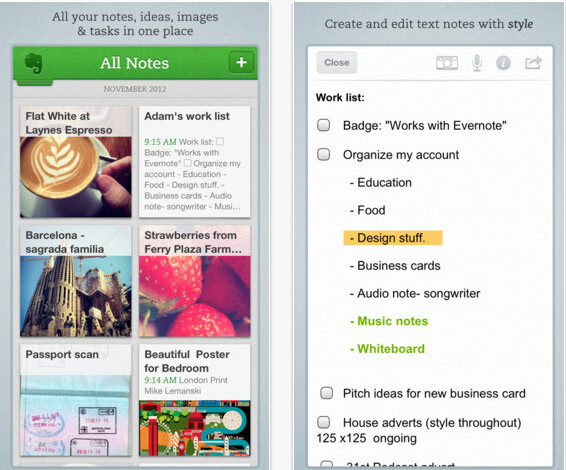 Along with iOS, Evernote made its name as a desktop app – with Windows, Linux, and Mac compatibility. If you ever find yourself jumping ship and going off to Android or even Windows Mobile, Evernote follows. Cut the distractions and junk, if you are looking for a writing app that does what you want to do – just write – then iA Writer is the application you are looking for. iA Writer allows you to save your entries into Dropbox and through the cloud to your other iOS and Mac devices with iA Writer. Aside from the feature known as Focus Mode, where all but the current three lines you are working on is blurred, as a way to keep your attention on what you’re writing, iA Writer isn’t feature filled. There isn’t a way in-app to go to other entries. If you are looking for an app that is as barebones as it can get, while still sticking to the journaling routes of writing in a word processor – while on the go in this case – then iA Writer is the $0.99 universal app for you.